What if you could improve years of late habits in just 28 days? Are you tired of being the person who’s always late? Do you wish other people could depend on you? Learn the real reasons people are late (and it’s not because of the traffic!). Know how much time you really need to get ready each day. Manage your time so you can be on time. Create and utilize the Grab-and-Go System. Throw out energy-stealing clutter that contributes to lateness. Work towards being on time even when plans go awry. Hold family members responsible for becoming more timely. Encourage late friends without enabling them. Enjoy spontaneity and freedom within boundaries. 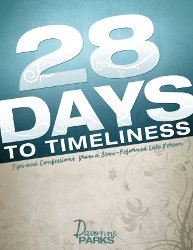 In addition to 28 easy-to-read chapters, 28 Days to Timeliness is further broken down into well-organized sections.